Last weekend I finally put up my Christmas tree. I’d been hanging out to do it since December 1st. However I didn’t want to decorate the tree on my own, and my parents had offered to come around and help. But it took more than a week to find a day when we were all free. Finally the whole family got together, cranked up the Christmas tunes and decorated my tree. 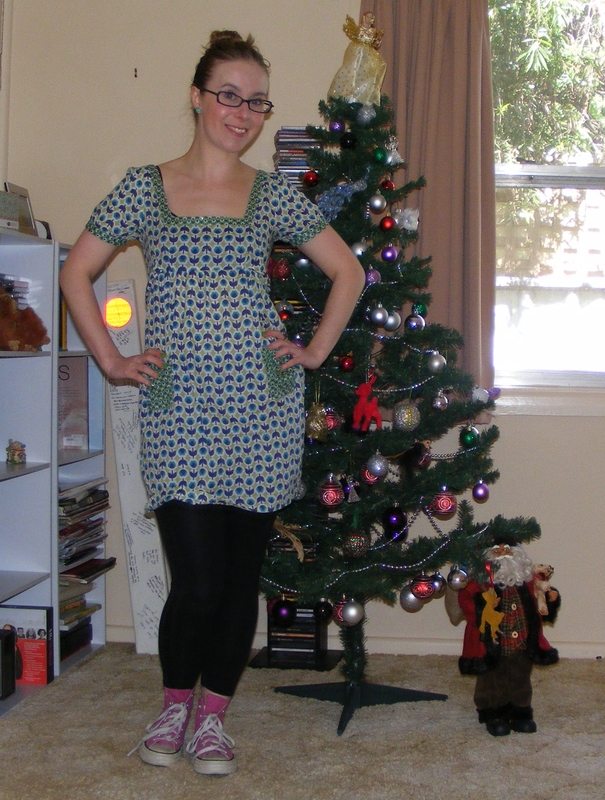 I’ll have some more detailed tree photos for you next week, but for now I’m going to show off my outfit. 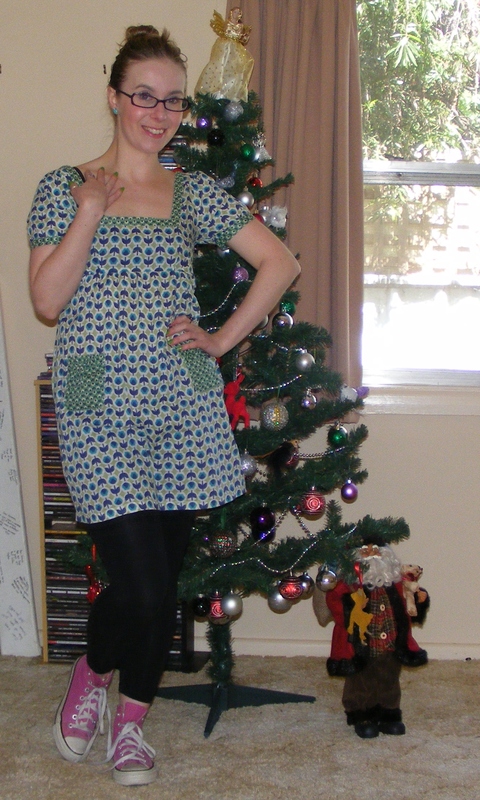 I got this dress a few months ago in one of my massive op-shop hauls. I adore the print on it, and it’s really cool for summer. The only thing I don’t like about it is the neckline. It’s so low and that makes it hard to find a bra that will work with this dress. I think I tried on half of the bras in my drawer with the dress, and almost all of them were peeking out the top. Pockets! I adore the fact that the pockets on this tunic are a slightly different print to the rest of the dress. It’s a cute touch. 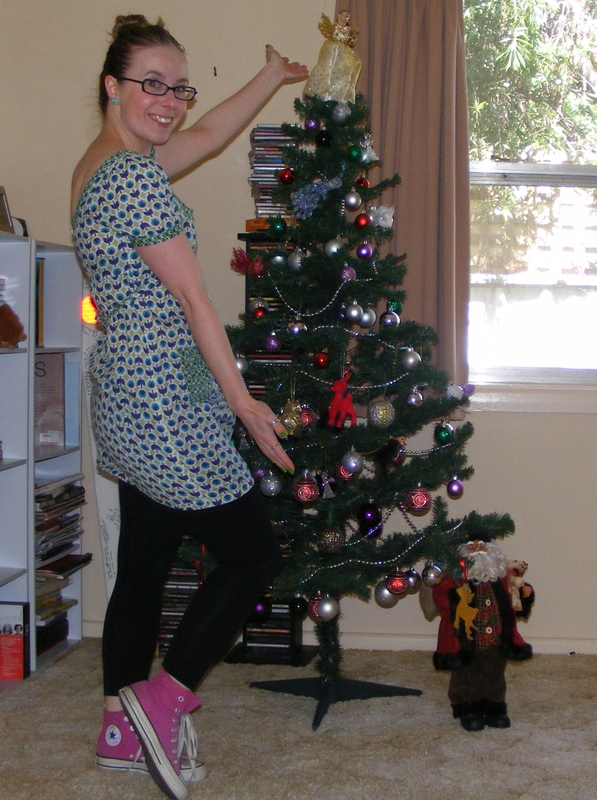 What did you wear to decorate your Christmas tree? Love those earrings – and all the more so because they came from your grandma. That’s so sweet! Hmmm, I wouldn’t say as though I have a particular type of tree trimming outfit, though if we’re home alone, pajamas with a vintage robe over top would be a fairly common sight. Merry two weeks until Christmas! Merry two weeks until Christmas to you too! Thanks so much for your compliment of my earrings. I’ve got a big box of earrings that all came from my Nana. She only ever wore studs, and I usually choose dangling or hoop earrings for myself, so it’s been a nice change to wear some of her vintage stud earrings.